When hunger strikes, get your Nature Valley™ Protein Coconut & Almond bar, containing 20% of your daily protein needs and 50% less sugar †. This gluten-free snack has 40g of carefully selected ingredients, like peanuts, coconut and almonds dipped in a smooth coconut flavoured coating making it a great on-the-go snack for your next adventure. Roasted peanuts(23%), isolated soy protein, chicory root extract, almonds(12%), coconut(7%), vegetable oil, glucose syrup, whey solids, sugar, fructose, maltodextrin, humectant (glycerin), tapioca starch, salt, coconut cream powder (0.7%), emulsifiers (sunflower lecithin, soy lecithin), flavours, flavour enhancer (sodium bicarbonate). 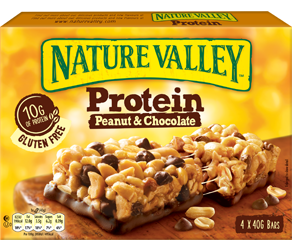 Contains peanuts, almonds,soy and milk ingredients. May contain other tree nuts.